American Bulldog Dogs - The American Bulldog is a breed of working dog developed for catching livestock and for protecting property. Though larger in size, they are the closest surviving relative of the Old English Bulldog because they were not altered to as great an extent while in Colonial America as their European cousins. There are generally considered to be two types of American Bulldog, the Johnson type and the Scott type, named after the breeders who were influential in developing them, John D. Johnson and Allen Scott. These are more commonly known as Classic or Bully type and Standard or Performance type. This information is licensed under the GNU Free Documentation License. It uses material from the American Bulldog article on Wikipedia.org. 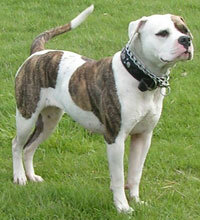 American Bulldog Breeders - Advertise your kennel puppies and dogs here.